Each dune is different. Every urinal pee stain is, too. Uncharted 2 began with one of the greatest action sequences ever — a literal cliffhanger escape from a dangling train. It set the tone for the entire game and gave me a tutorial in the basic actions. The rest of the game, as good as it was, never surpassed it for visual and dramatic flair. Uncharted 3: Drake’s Deception begins with a different sort of action sequence — a barroom brawl that quickly teaches me how to throw punches, dodge, grapple my enemies and break free from their clutches. It also shows me what is right and what is wrong with the game. The fight is exciting and serves to draw me into the game quickly. 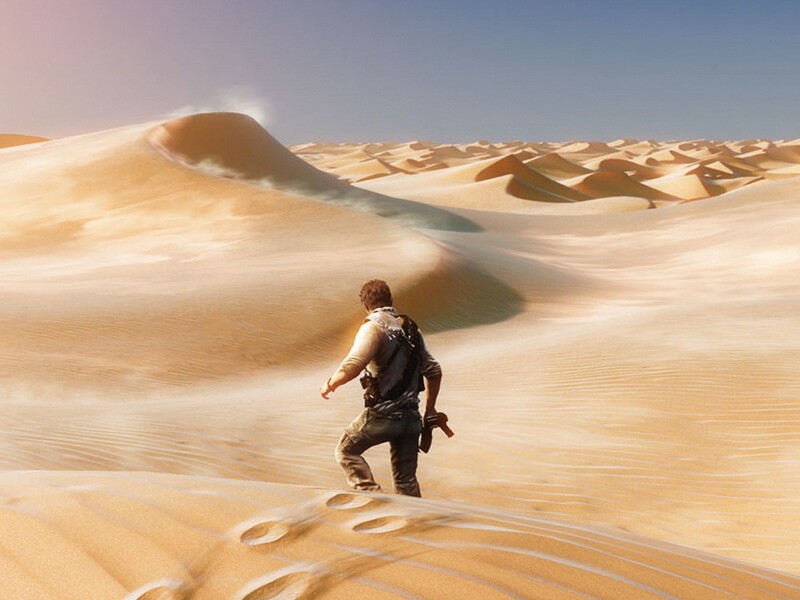 Even though Uncharted 3 has a story — something about “the Atlantis of the Sands,” which makes about as much sense as “the Cat of the Dog” — it is primarily an exploration and action game. I might be asked to watch a movie for a few minutes, and listen to some mumbo jumbo about archaeology, but I’m mainly there to fight, wander around and solve puzzles — and the game doesn’t waste too much time in getting that started. The bar looks and sounds wonderful. Every footstep, shuffle and fall to the floor is given its own unique sound. The rooms echo distinctly — the warm muffle of the wood floor contrasts with the echo of the bathroom’s hard tile. And in the bathroom itself, each urinal features a unique pee stain on its porcelain, and the tile is mildewed in a realistic, un-programmed pattern. Even the tables in the bar itself seem to have been made by several manufacturers, not just clicked into place using a computer’s “Copy” function. But the characters also move with an unnerving speed. They whirl around too quickly. They suddenly slide short distances across the floor without moving their feet. And my actions are integrated into the pre-rendered scenes, meaning that one moment I’m controlling Nathan Drake, the explorer/hero/brawler of the game, as he punches and kicks some nameless goons, and the next moment I’m simply watching him slam someone’s head into the toilet. It’s hard to know where I end and the programming begins. The game’s next sequence transports Drake back in time to his childhood where he is clambering along walls and rooftops like the adult he will become. Here again, there are too many moments of pre-programmed instruction, where Nate can only move in one or two directions, making the climb less of a maze than an obstacle course I must steer him through. And he telegraphs his moves by reaching for the next handhold before I have a chance to determine where it might be. I no longer worry that I’m dangling from a building — I’m just following instruction. THE GOOD: More than just lavish graphics, Uncharted 3 uses sound, color and lighting to create a setting — an important thing in an exploration game. THE BAD: A game that looks this good shouldn’t have so many animated glitches. THE BOTTOM LINE: Uncharted 3: Drake’s Deception tries to look like a movie and play like a game, and can’t always find its own identity between the two.